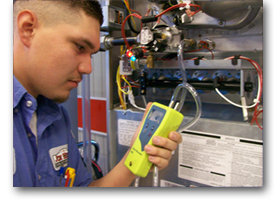 I started the Jon Wayne HVAC program in the fall of 2009, in the midst of a recession. Jobs were scarce, and I was worried about my future. I figured that, even with a downturn in the economy, HVAC would still be in demand. Mr. Breazeale was an outstanding instructor who provided me with the practical knowledge to succeed. After graduation, I began applying to many different companies in my area. Several of these companies mentioned the value of Jon Wayne's training. One company called me back and gave me a written test to check my skills. Wes' instruction allowed me to pass the test easily. I was able to secure a job, in a tough work environment, within two weeks of searching. This new position came with a substantial raise over my old work. 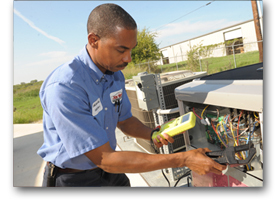 Jon Wayne's training allowed me to achieve my goal of starting a new career in HVAC. Hello, my name is Malvin Henry, and I am proud to say that I am a graduate of the Jon Wayne Academy. 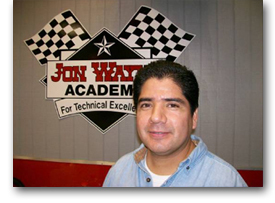 I highly recommend the Jon Wayne academy to anyone interested in pursuing a career in the HVAC industry. If I can do it, any one can. I had no previous history or background in the HVAC field. My prior work experience was in the manufacturing industry. So, I decided to learn a trade, and I chose the HVAC field to study. I enrolled in the Jon Wayne Academy in May of 2009, and after six months of classes and training, I am proud to say that I am now a certified maintenance technician out in the field servicing units on my own. I am a true testament to the possible success anyone can achieve through the knowledge gained from the Jon Wayne Academy. I graduated from Jon Wayne Academy in 2009. I was nervous about changing careers when I joined the Academy. Once I started, I quickly learned I had no reason to be nervous. Wes' method of instruction and knowledge of the industry was exactly what I needed. Now that I have been employed at Jon Wayne Air Conditioning as an Installation Technician, I have been able to apply what I learned from the Academy. The hands on training and the one on one attention I received gave me all the knowledge that I needed to pursue my new career. 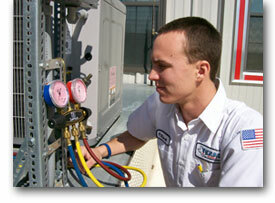 I feel that if a person wants to get into the HVAC industry, Jon Wayne Academy is the best place to start. I wanted to take the opportunity to express my gratitude on what the Academy has done for me. My previous work experience was in the wireless industry. I had no experience or previous knowledge in the HVAC industry. After separating from my previous employer of 11 years in April of 2009, I wanted to enter a career that was in high demand. 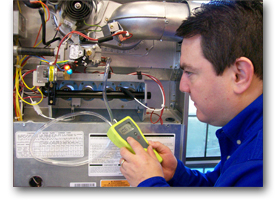 I researched several different service industries and always seemed to wind up back at the HVAC field. Air Conditioning interested me due to the fact that it would allow me to help customers and learn a skill that would last for a lifetime. While attending the academy I learned the mechanical, electrical and so much more about the industry. It was a rewarding experience and a positive impact on my career. I am now an employee of Jon Wayne and can honestly say it was a direct result of what I learned from the JonWayne Academy. Since I enrolled in the Jon Wayne Academy class I have attained a wealth of knowledge about a subject I had no prior experience. I feel I am armed with the knowledge and education to become a highly qualified service technician. I look forward to applying what I have learned in the Academy so that I can provide great quality and service the community. Special thanks to Wesley Breazeale and Jon Wayne Academy for sharing the knowledge and experience in an easy to understand manner, which made the class a success.